Location: Greater Morgantown Area, rail-trail along east side of Monongahela River north of Fairmont from Prickett’s Fort downstream through Morgantown. 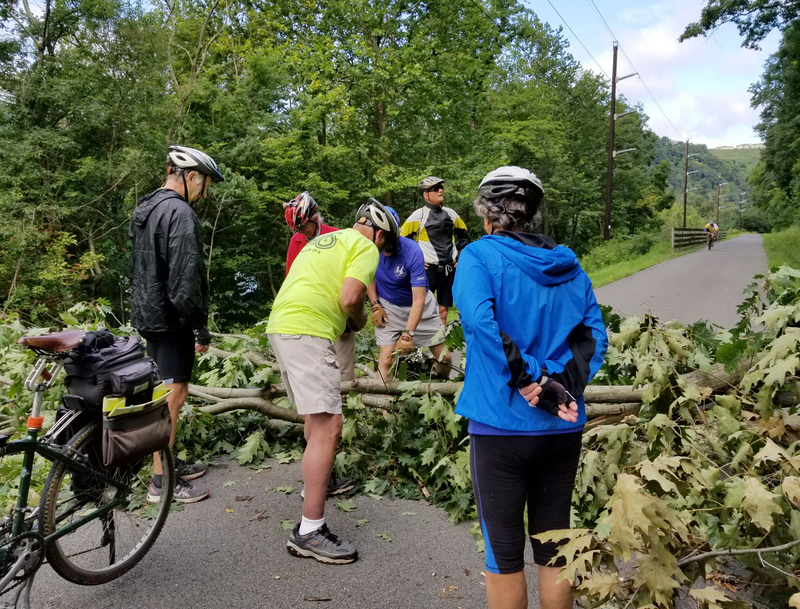 Mon River / Caperton / Deckers Creek Rail-Trails form a tri-county, 46-mile linear park that links urban and rural communities in north central West Virginia. The primary trail manager, the Monongahela River Trails Conservancy, is one of the few volunteer non-profits nationwide to maintain such an extensive trail system, with the help of an innovative partnership between state, county, and city agencies and community volunteers. The trail is a low-impact recreation corridor, alternative transportation route, community green space, outdoor classroom, and natural and cultural heritage park. 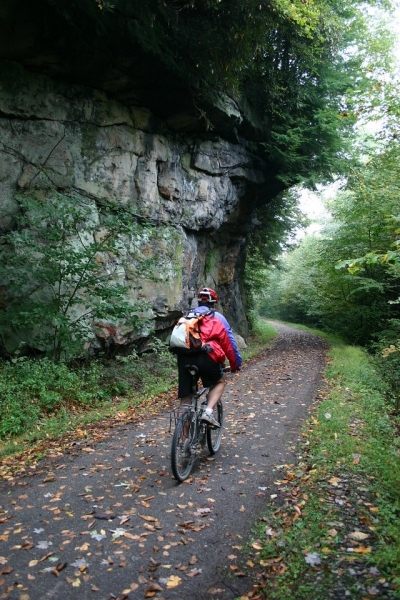 The trail showcases past and present land use and management as it borders Prickett's Fort State Park, a historic frontier settlement, Arthurdale Heritage, the nation's first New Deal community, the Bretz Coke Ovens, a national coal heritage landmark, and Greer limestone, an active limestone quarry. The trail passes through forests, meadows, rhododendron and hemlock thickets, farmland, and downtown shopping districts, as it parallels Deckers Creek and the Monongahela River, allowing people of all ages and abilities the pleasure of outdoor recreation including walking, cycling, in-line skating, and cross-country skiing. 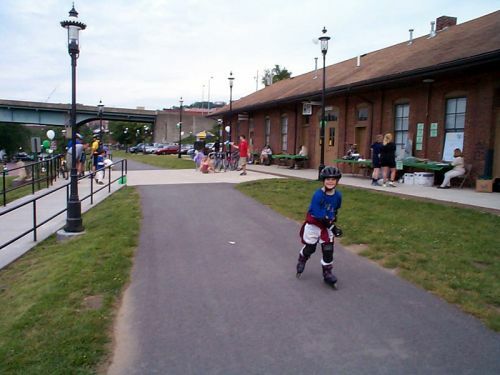 The popular rail-trail is used by residents of Morgantown and surrounding communities, West Virginia University staff and students, a wide mix of tourists, the health networks of Mon General and WVU Hospitals, as well as many rural communities with otherwise little access to public parks and health facilities. Tree Down!. Photo by Mary Shaw. Thank goodness for people who care! 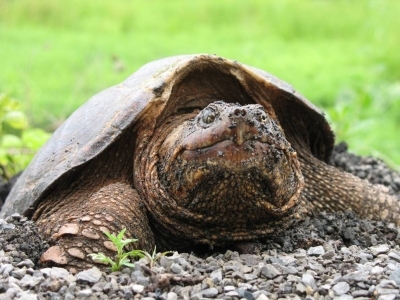 Too many times have I found my self standing in defense of our home rivers-- the Monongahela River and Deckers Creek-- which have both taken a beating through history and despite a legacy of pollution, are on the rebound. People say the river is too polluted to use and despite the water quality being better than anytime in the last century, the perception of legacy pollution is lasting and has created an apathetic crust in our communities. But-- underneath is this rail trail, its proximity to the river, and its spurring use of not just the trail, but the river. People are discovering our home rivers can be an asset and that we can be proud of the waters that flow through our community, versus having them play a perpetual role as polluted and not good for anything. This trail is wonderful, it has spurred economic development around recreation, and has been overall an uplifting thing for nearby communities. These trails exhibit the history and beauty that are part of our communities, they go through Morgantown and by nice restaurants, and are a quick way to get outdoors in the evening, or for an extended trip. I am thankful for those who have the vision to exhibit the worth of our land and water, despite the obstacles. These are wonderful trails!